You would be hard pressed to find a better example of dedication to community than Shelby Heinemann. A resident of Heritage Landing since 2004, Shelby has become a fixture in the World Golf Village scene. In fact, if you live here or have kids in the area’s schools, you have likely seen her busily helping out at school, showing properties to potential new residents, or smiling and waving at neighbors. For Shelby, it’s these seemingly small gestures that add up in a meaningful way. Shelby has been a Property Manager with the Davidson Companies since May 2012 and boasts almost seven years of experience in the Property Management field – most of that experience garnered in World Golf Village. A mother of three, she is also an active education advocate within St. Johns County Schools and a Davidson Cares Board member. Davidson Cares is an organization that offers support for local schools, including Mill Creek Elementary, Wards Creek Elementary, Palencia Elementary, and Pacetti Bay Middle School. Shelby’s husband Jeff also does important work for the community as a Recruiter for the Wounded Warrior Project in Jacksonville. In addition, Jeff and Shelby have both enjoyed volunteering with the Nease High School Panthers Football team this season. Shelby slowed down for a moment to answer a few questions for us. As a native Wisconsinite, what attracted you to our area? We love the fact that it isn’t freezing cold! I really miss the fall with all the changing colors and snow at Christmas, but we can always go visit to experience that! What is your favorite aspect about living in World Golf Village? The sense of community that is so present. Most people you meet are not originally from this area, so there is an instant sense of camaraderie and friendship that begins. The initial reason we chose to live in World Golf Village is because of the great schools for our kids, and now there are so many reasons to stay! You are a valuable Davidson Cares Board member and supporter of quality education in our area. What drew you to this cause? When I started at Davidson, they were just in the beginning stages of putting Davidson Cares together. I was in awe of the awesome fundraising ideas and efforts to give back to the teachers and schools in such amazing ways. I am very proud of all Davidson Cares has done in its first year and I look forward to all the great things to come! Tell us about you and your kids’ involvement with St. Johns County Schools. This is the first year my children are in three different schools. 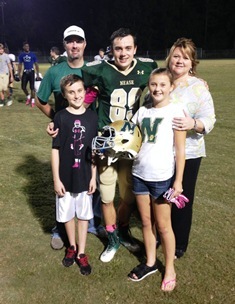 My son, Jack, is a freshman at Nease High School where he is in the Communication Academy and just finished up football. My daughter, Malory, is in 7th grade at Pacetti Bay Middle School. She was just elected Vice President of Student Council and plays lacrosse for Creeks. My youngest son, Sam, is a 4th grader at Wards Creek Elementary. He plays flag football for the Villages Football Association. I am in my fifth year on the Student Advisory Council at Wards Creek, which I truly have enjoyed being a part of. This is also my first year volunteering for the Nease High football team, which I have also loved. As a Property Manager with Davidson and Mom of three, you certainly stay busy! What do you like to do when you get free time? Our whole family loves football. We even have our own Fantasy Football League. Sunday is a great time to relax with the kids and watch all the games. I also love helping out with the activities my kids are a part of as well as going to the beach when we have time.